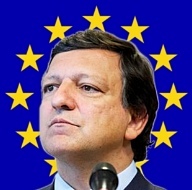 Emperor Barroso has thrown his teddy out of his pram after his plans for a 6% EU budget increase were scuppered by the Poles. I regret that a small number of member states were not prepared to negotiate in a European spirit. Don't worry oh great one, I'm sure the matter will be "negotiated" in the "European spirit" by asking the question over and over again until you get the "right" answer. Or just change a couple of words and don't bother asking again. That's how it's done in the "European spirit" isn't it?